IKRUSH Womens Seneca Lace Up Ribbed Bodysuit. This bodysuit is such a beaut! 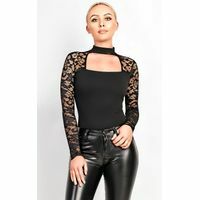 It is long-sleeved with on trend lace-up detailing at the bust. It is made from a soft ribbed effect fabric and has a simple popper closure. Team with heels for a stunning night out look!Polyester/elastaneUnderarm to hemline is approx.